Marion Montgomery is urging fellow dog walkers to pick-up discarded plastic during each outing. A dog owner has rounded up an army of volunteers to start a campaign to pick up plastic waste. Marion Montgomery, from Stonehaven, is urging fellow dog walkers to pick-up at least two pieces of discarded plastic on each walk they take. The Paws on Plastic campaign was started in December and the group already has 200 members in the town and more than 1600 around the world. Marion said: "There's a million dogs in Scotland so if every dog owner picked up two bits a day it's a lot, it really does make a difference." Paws on Plastic group member Paul Alves said: "I'm normally out walking dogs for a couple of hours each day and the plastic is everywhere, doesn't matter where you go, you always see something that needs picked up. "I've seen quite a big difference but there's still a long way to go, a lot of things that shouldn't be dropped that still need picked up. "It does make you quite angry because you never know what the dogs are going to get hold of, might be something that's not going to be good for them. 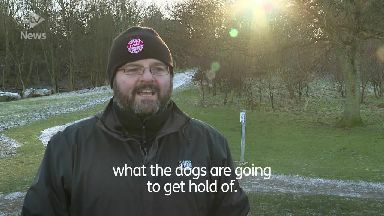 "My advice to other dog walkers is if you see anything that needs to be picked up, just pick it up, get it into the recycling or if it needs to go in the bin just put it in the bin. "The problem of plastic in our seas has been well documented, but environmental groups say we all have a duty to keep our land clean too." Nicola Turner from Keep Scotland Beautiful has welcomed the campaign. She said: "The problem of plastic pollution is huge in Scotland and globally and often it feels as though you can't do anything about that but one of the things that we really love about the Paws on Plastic campaign is this 'can do' attitude. "It's often hard to see what harm it causes the environment, often we see it in our parks and green spaces, but what we don't understand is how it gets into our parks and our rivers and lakes and then into the sea after that so what we see in our parks is just the tip of the iceberg."